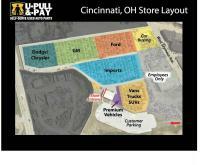 U Pull-&-Pay (UPAP) is a dynamic company with a nationwide network of retail self-serve used auto parts stores. As a customer focused organization, UPAP exists to provide low cost, used auto parts to our customers. Our inventory and interchange information services enhance the customer experience. I-75 to the Seymour Avenue Exit. Go West on Seymour Avenue and the store is on the Right hand side.